With Windows 8 officially here it’s time to start thinking about the implications of moving your users or clients to it. Under the hood, Windows 8 is a solid OS but from a usability standpoint, some users are going to be frustrated. One of the biggest frustrations that they may experience is the lack of a Start Menu and the constant switching between the classic desktop and the new Metro Start Screen. The good news is, for these users, there is a way to add the Start Menu back and I would like to show you how. Classic Shell is a free open source project that will add the Start Menu (and some other nice features that were available in older versions of Windows) back into Windows 8. It doesn’t replace the new Metro Start Screen so you can still work out of it if you would like. 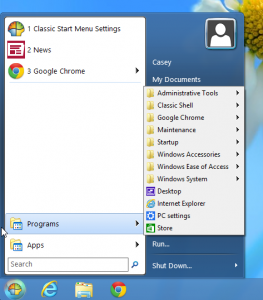 Once you download Classic Shell and install it, a new Start Menu will appear on the classic desktop Taskbar. The first time you click on it you will be prompted with a Settings menu where you can choose the Start Menu style you want. The second tab gives you lots of options for tweaking how the Start Menu operates. One of my favorite options is the ability to skip the Metro Start Screen when Windows starts so you are dumped right into the classic desktop. 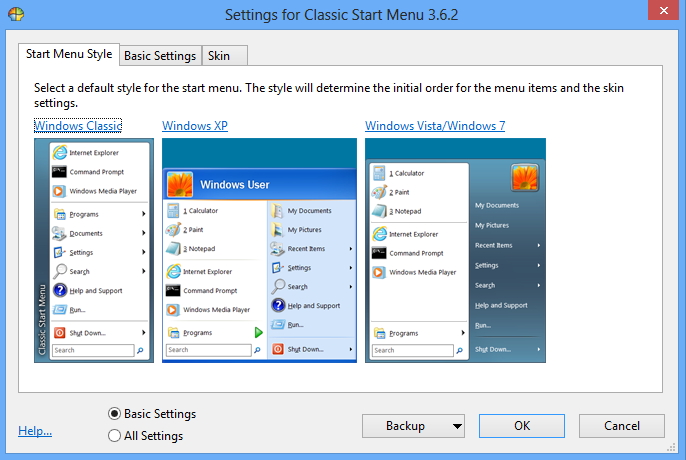 The third tab gives you the option to pick from a list of several different Start Menu skins. 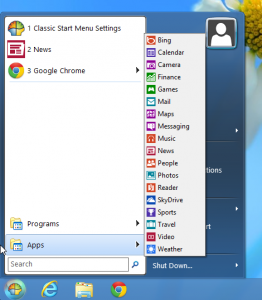 The Start Menu itself contains not only a Programs group but also an Apps group that has links to all of the Metro Apps so you can access them directly while in the classic desktop. 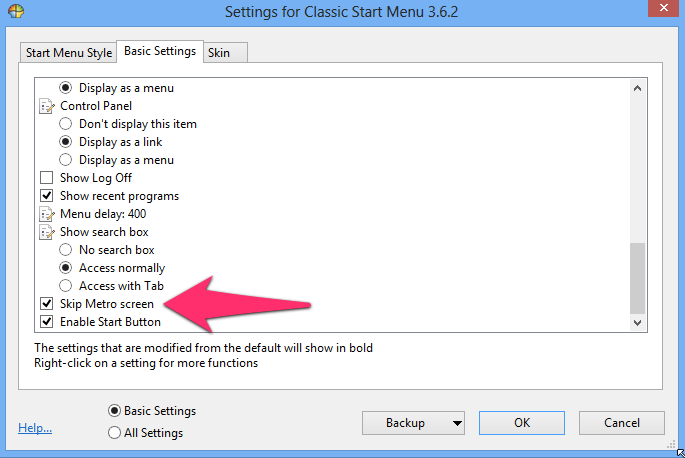 Classic Shell feels like the missing option that Microsoft left out of Windows 8. With it, you and your users can now have best of both worlds: a solid OS, access to the new Start Screen with Live Tiles, and now a Start Menu where you can fully operate out of the classic desktop. If you would like to look into a few other Windows 8 Start Menu options, check out Start8 and Pokki Menu. I just stumbled on your website and I have read a lot of articles you mentioned here. Thanks so much for all the educative information you have shared. Keep up the good work. 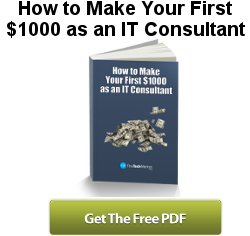 I am an aspiring Techie and almost dependent on the internet for doing stuff. Glad that i can fix my own computer !!! You are very welcome Vikrarm! Glad you like the site.